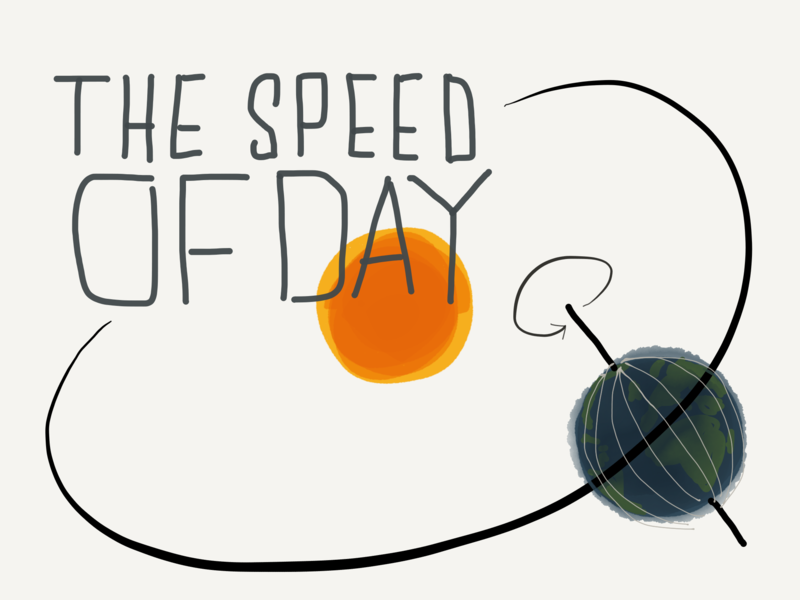 The “speed of day” is the speed of Earth’s rotation: 1600 kilometers per hour (kph) which is about 1000 mph. 1600 kph is fast. Most people have never experienced anything moving at this speed. Commercial jet airplanes fly at 1000 kph (600 mph). However, it’s hard to understand that speed because we don’t ever see them flying at ground level. The speed of sound is 1200 kph – the Earth’s rotation (at the equator) is carrying us 400 kph faster than the speed of sound. That is incredibly fast! By using our imagination and “seeing” the speed of day we can understand just how fast we are moving. And by understanding how fast we are moving, and feeling just how long a day is – even at such a breathtaking speed – we can really feel the size of the Earth. Let’s start by stopping time. Pretend that everything is stopped. The Earth has stopped rotating and orbiting. 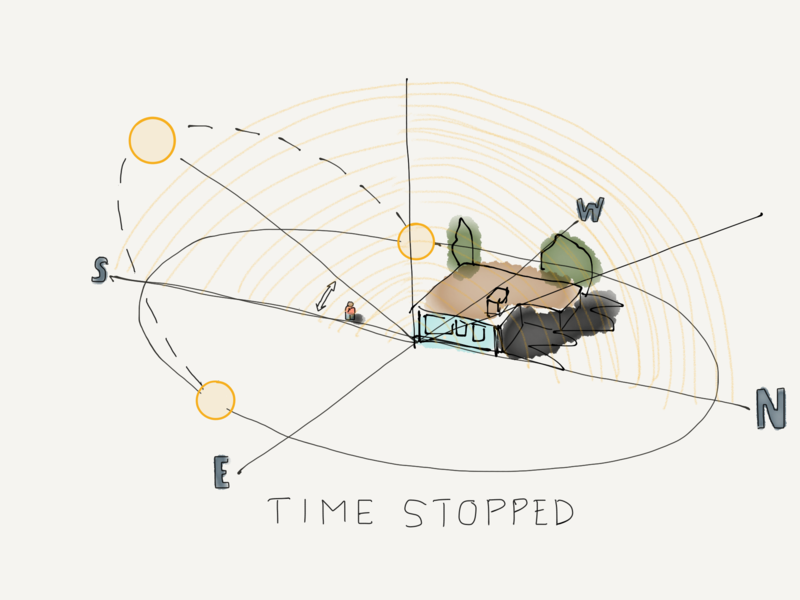 It might seem strange to stop time to see something move, but it helps us to get our visualization right. Pretend that you stop time at noon and you are standing outside facing southward. The Sun is now stopped in the sky at exactly noon at the highest point in the sky. So far we haven’t imagined anything too weird. But, we are about to add something nobody has ever seen before. Imagine that there is a very thin (1 cm thick) north-south, glassy, shimmering curtain of light (as thin as a veil) that ripples down from the Sun in the sky. The thin curtain or veil of rippling light is oriented directly north and south. 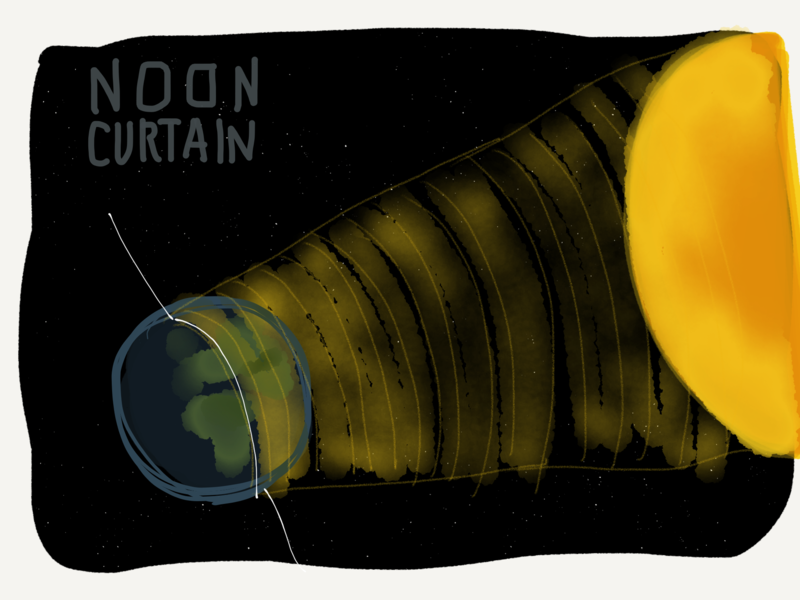 Because it is noon, this “noon curtain” drops from the Sun directly above you. The curtain appears to originate high above the atmosphere and drops down through the sky right down onto your head. It stretches to the north and south as far as you can see. You can step to the left (east) and the curtain is to your right. You can step to the right (west) and the curtain is to your left. You can see it reaching from the Sun down to the ground like a gigantic shining, glowing curtain of light. This “noon curtain” helps us visualize the line of noon in the sky. Every point on the Earth passes through this curtain every day at noon. And remember, what we call noon is the time of day when the part of Earth we are on passes “through” this curtain. Time is still stopped right now so the noon curtain is not moving. Let’s restart time, slowly, to see what happens to the curtain of light. Still facing southward you see the giant curtain begin to slowly “move” toward the west (the right). As you know, the curtain is not actually moving; it is us moving. As time returns to normal the curtain begins to “move” faster towards the west. 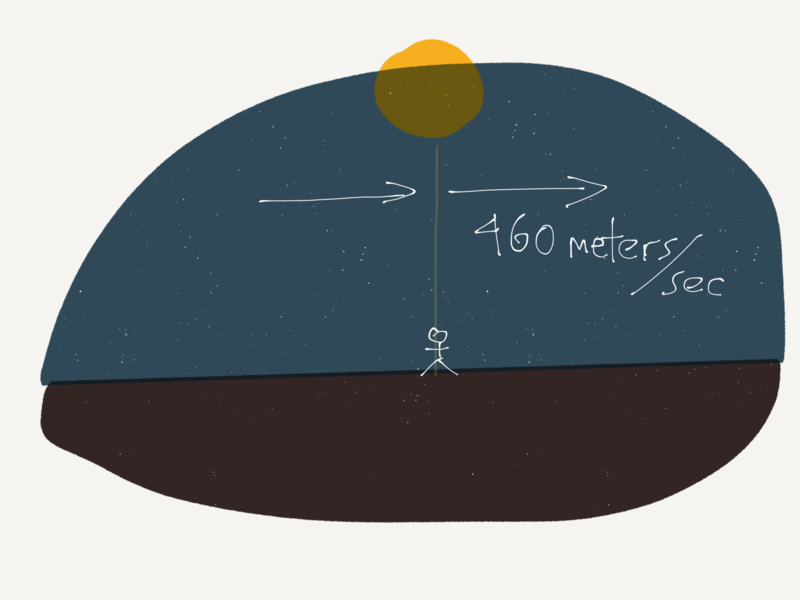 Really, as the Earth rotates, you are carried further and further away from the noon curtain. The curtain is “moving” because of the newly resumed movement of the Earth. You see the curtain seem to travel away westward but it is actually us traveling away eastward. Eventually, the sun will “set” – actually the Earth carries us until the Earth itself begins to block our view of the Sun – and the sun and the “noon curtain” will disappear. All we have to do is to speed up time until just before noon the next day. This time, to experience the noon curtain, instead of stopping time we can just slow it down a lot. Let’s slow down time by 300 times so that as the noon curtain approaches us from the east (actually we are carried through it), the curtain floats in at a slow walking pace (about 1.5 meters per second). Imagine the towering curtain of light floating towards you from the east. It is moving as slow as a person walks. It crosses past you and it continues westward. During this noon curtain passage time is slowed so the Earth’s rotation is also slowed by 300 times. This is a speed that seems like it might correspond to the “speed of day” – the day goes by so slowly and the movement of the Earth is barely perceptible. However, the Earth rotates 300x faster than walking speed. For the last visualization let’s imagine passing through the noon curtain at full speed. What would that look like? 1 kilometer every two seconds. The noon curtain spreads across the sky and we speed under it. The distance we move to meet and go through the noon curtain is immense. Every day, 24 hours a day, the Earth rotates, carrying us on its surface under the noon curtain. As you get good at visualizing this transit of the noon curtain, you can begin to feel just how big the Earth is. Imagine the curtain “moving” constantly at this high speed for the entire day. This is the speed of the Earth’s rotation. We are carried along under the day at the speed of Day. 460 meters per second. Every day. The speed of day.